Delbert Miller's art is as much a calling as it is a career. As a singer, carver, drummer and keeper of the Skokomish tribal ancestral history, Miller has taken on the role and responsibility of carrying on the traditional legacies of his elders. 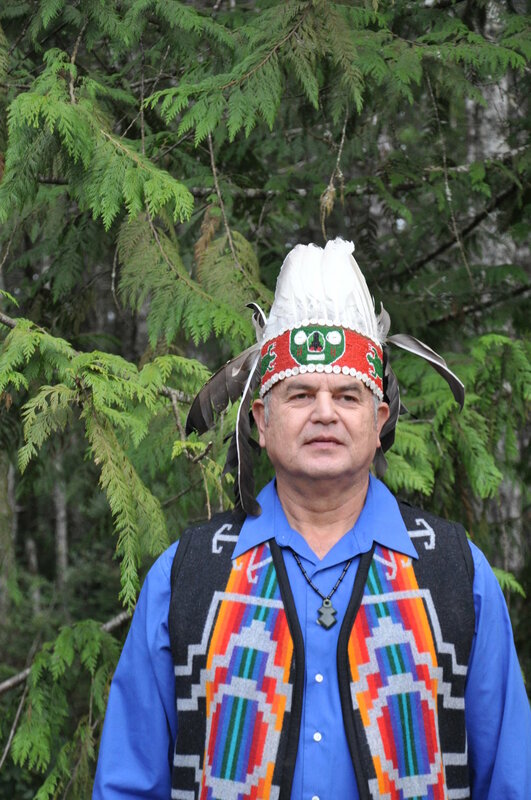 Recently the Skokomish Tribal Council and US Forest Service have allocated a Cedar tree from the Olympic National Forest to support the work Delbert has been doing with youth from local tribes. Delbert is humbled to share this gift of Seeqwulal, or Grandmother Cedar Tree, by training a small group o f Salish apprentices on the spiritual aspects of carving. They will design and carve a matching set of Tsaqt3d, carved posts historically serving as cultural identifiers to visitors (an art form in danger of disappearing if it is not shared and preserved). Delbert will also teach the youth how to utilize their own personal spiritual gifts to bring their work to life. He seeks to strengthen their sense of personal cultural identity. And for his work as a culture bearer, has was named one of First Peoples Fund's 2014 Community Spirit Awards honorees. The CSA award is given annually to individuals who show exceptional passion, wisdom and commitment to serving their communities. Miller is a great example of that, fellow Skokomish community leaders say, by the way he has strengthened youth, families and the community with unwavering leadership. "Delbert reminds us to remember who we are and where we come from, and secures the foundation of our identity," said Pam James, a fellow Skokomish tribal member. "He helps our young ones know where they belong—that they are part of something greater than themselves. Delbert is truly a keeper of culture and history for our people." You are one of the last historians and keepers of the family tree of your ancestral villages. What is your role? I have been taught about some of the prophecies, and have watched them unfold. I was given a role to be a neutral observer for life. I hold close a teaching of our late uncle, "Don't tell me what you are going to do. Show me what you have done." He wasn't gentle about it either. He taught me about the standard to live by—to never forget the ancestral law. So, if I don't teach what I was taught, who will? My role could be described as responsibility... as a responsibility to "feed the people." You say you have been fortunate to have been trained by your elders in some of the ancient ceremonies. What was that experience like? To be trained by people who could see right into you makes you understand what it means to be true. You have focused much of your life's work on preserving the art, carvings, drumming, songs and traditions of your ancestors. Do you ever get discouraged that those traditions will not survive? I believe the traditions will survive, but if they don't, I do not want it said that I did nothing to prevent it. You are planning to teach Skokomish youth about canoe technologies, protocols and teachings. How do you relate to the youth of today? I see that the youth are willing to learn. If I am true to the spirit, it will call everything it needs. We have introduced our youth as future leaders in ceremony—we have had them sit in the seat of honor, tell oral traditions, and teach songs. We tell them of their old people and where they lived. I believe in identity and history as keys to anyone's foundation. What keeps you motivated as an artist? I don't think of myself as an artist. Rather, I think of myself as someone who understands the ceremonial tools of our old people. These are much of what is called art today. In the ceremonial items are family lineages, family identities, and prophecies that you are supposed to see along with spiritual value. In an older time, they were closely guarded items. I remember seeing the older people do ceremony to bring the tools to life. After that they never left them laying around and were mostly kept from public view. I make those kinds of things. That is what motivates me. I am fortunate to have listened to people who were living before highways were built and were born in the longhouses.